Although the factory speakers that came with your high-definition television are somewhat sufficient and acceptable, they simply don’t provide you with the booming bass and overall surround sound experience that you anticipated having within your home when you first purchased the HD TV. Fortunately, there are several simple steps that you can take in order to drastically change this, by purchasing a high-quality surround system to complement your high-definition equipment. One of the first steps that you will need to take is to simply study and research the connections that are already built into your television. Many consumers make the major mistake of purchasing their surround sound equipment and systems without first checking to make sure that their selection will even be compatible with the television that they have at home. Even if you will be purchasing a brand new television to go along with your brand new sound setup, you will still need to check to make sure that everything can easily be connected in order to function properly for you. You can save money by going for Bose coupons and deals at reasonable prices. The next step of the process is to make sure that you consider the space that you have available to you. This is of the utmost importance simply because you may end up purchasing a system that is too big and powerful for your relatively small space or too small and weak for your relatively large space. For example, if you have a two-story home then your ideal sound setup will be much different from the standard setup of a consumer who lives in a one-bedroom apartment. Your best bet would be take measurements of your allotted space and the dimensions that you have to work with before you start to search for particular models, according to How Stuff Works. There are quite a few major retailers and brands that have qualified customer service representatives available via phone, email and in-store who can assist you in finding the best setup for your specific space requirements. When you see the vast selection of options that are readily available and waiting for someone like you to purchase them, you can quickly seem to forget all about your budget and throw sense and reasonableness out of the window. Doing so would be a major mistake and is truly not necessary. The best approach to take would be to simply shop competitively for the best prices available on the specific models of systems and accessories that you have your eye on in order to get what you want while also remaining within your budget. You can choose from a wide selection of high-end surround sound speaker systems and accessories along with a vast assortment of premium sound equipment, components and parts that you can use to upgrade your home theater system. Whether you shop online or in-store, there are quite a few different Bose coupons and deals that can be used in order to drastically reduce their sales prices so that you can walk away with a great product for a great price. Years ago, the standard home theater system consisted of several speakers and a receiver that were all hooked into the television. Nowadays, you can receive premium sound quality through purchasing a high-quality sound bar. In most cases, according to CNET, sound bars are more affordable than surround sound speaker systems, and perfectly designed for consumers who have a limited amount of space available to work with when creating their home theater systems. Therefore, even though you may have your eye on a set of speakers, take the time to at least consider saving a substantial amount of money by going with a sound bar instead. I’m in the middle of building a new stereo system around my home, so this is timely advice. I love the piece about the sound bar. I was just considering a sound bar vs. surround sound for our room, and I think I’ll go that route. I am glad to be of service! 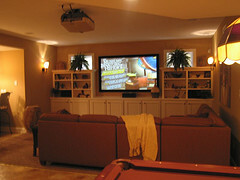 Sound is really important in a home theater system, take the time to select the right speaker.